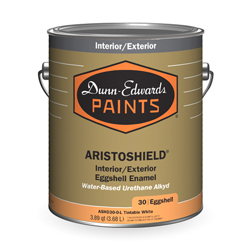 ARISTOSHIELD® is an ultra-premium interior/exterior ultra-low VOC enamel formulated with advanced water-based urethane alkyd technology for an oil like finish. It is ideal for use on high end residential, commercial, and industrial projects where superior performance and durability are required on doors, trim, cabinets, as well as metal surfaces such as wrought iron, garage doors, hand rails, and metal doors. 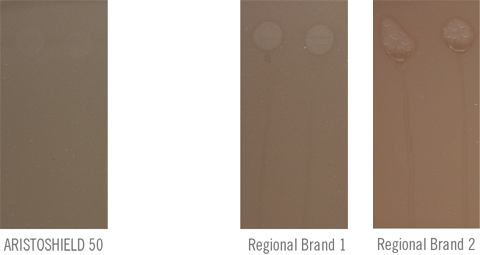 These are commonly used gloss levels for surfaces listed above. Gloss may be affected by texture, porosity of the surface and atmospheric conditions. 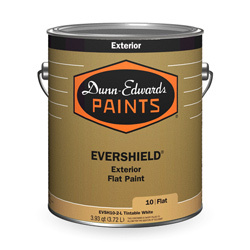 Please contact a Dunn-Edwards representative or your local store for specific product availability. 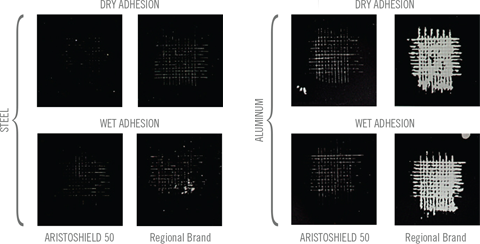 ARISTOSHIELD® does a better job at sticking to both steel and aluminum, as the competition is more prone to peeling on aluminum, especially when exposed to moisture. A three mil draw down of the paint being tested is applied to the desired substrate (glossy aged alkyd, chalky latex, metal, etc.) and allowed to dry for 24 hours. After 24 hours, two 100 square sections are cut into the substrate using a Gardner Adhesion Knife. For dry adhesion test, Permacel tape is placed firmly over the cut with a 2˝ overlap of the test area. The tape is then quickly removed at a 180 degree angle. The amount of paint that is removed from the substrate is evaluated and scored using ASTM 0B – 5B rating (0 meaning complete paint removal from substrate and 5 meaning no paint removal). For wet adhesion, a 1˝x 1˝ damp paper towel is placed over the cut section and allowed to rest there for ten minutes. After ten minutes, the paper towel is removed and the cut area is blotted dry of any excess moisture. Permacel tape is firmly placed over the test area with the same 2˝ overlap. The tape is then quickly removed at a 180 degree angle and the results are evaluated and scored (ASTM 0B – 5B). The lower the score, the poorer the adhesion is to that substrate. The same test method for wet/dry adhesion can be run again after a 3 day cure and 7 day cure to determine adhesion characteristic of the given paint. When two painted surfaces come into contact, such as a door and door jamb, they can stick together, or block. When that happens, the paint can peel from the surface. ARISTOSHIELD® clearly beats the Regional and National Brands, as their paint is sticking together and peeling from the surface. Surfactant leaching is the migration of water-soluble ingredients of the coating that is caused by exposure to high humidity or moisture. 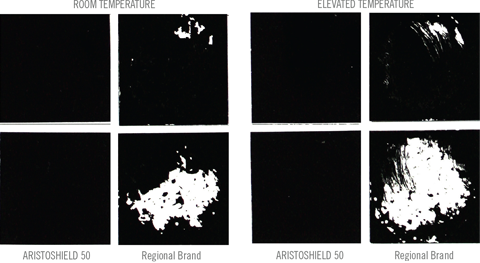 These areas are evident by a change in appearance of the film showing a glossy or soapy/sticky residue on the surface, which can sometimes be brownish in color. A three mil drawdown is cast onto a vinyl chart and left to dry for four hours. Five drops of distilled water are placed on two spots and left to sit for 30 minutes. After 30 minutes, the panel is tilted to 90º and left to dry on a drying rack overnight. The panel is rated on the degree of any appearance change of the film from 1 (severe) to 5 (no change). The test is also repeated at different cure times to see if it improves with dry time. It is always recommended that ARISTOSHIELD® be used over properly prepared and primed surfaces.